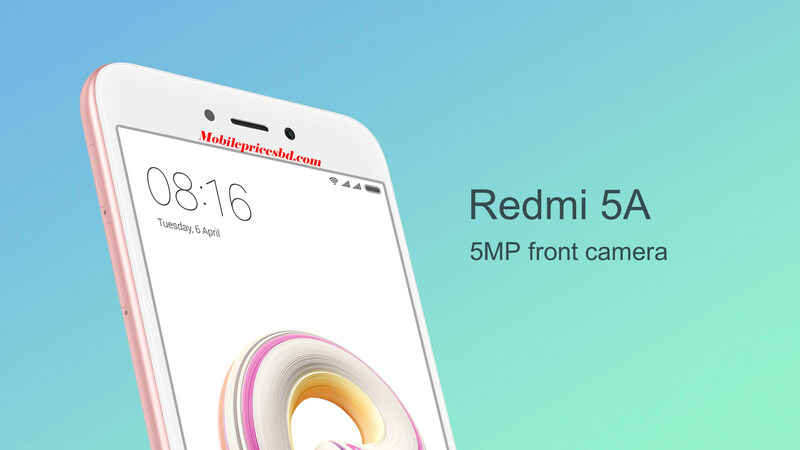 Xiomi Redmi 5 A Price In Bangladesh. Xiaomi Redmi 5 A mobile features a 5.0″ (12.7 cm) display with a screen resolution of HD (720 x 1280 pixels) and runs on Android v7.1.2 (Nougat) operating system. The device is powered by Quad core, 1.4 GHz, Cortex A53 processor paired with 2 GB of RAM. As far as the battery is concerned it has 3000 mAh. Over that, as far as the rear camera is concerned this mobile has a 13 MP camera PureCel Sensor supporting a resolution of 4128 x 3096 Pixels and the front snapper is powered by a PureCel Sensor. Other sensors include a Light sensor, Proximity sensor, Accelerometer, Compass, Gyroscope. So, does it have a fingerprint sensor? No, it doesn’t. For graphical performance that can make games run smoothly, this phone has got an Adreno 308 GPU. On board, storage is at 16 GB with the option to expand the memory by Yes Up to 128 GB. The design is one of the most important factors when it comes to mobiles. This phone is 8.3 mm slim and weighs 137 grams. All information is collected on their website. Xiomi Redmi 5 A smartphone launched on 23 November 2017. The phone comes with a 5.0-inch 16:9 ratio IPS LCD capacitive touchscreen display with a resolution of 720 pixels by 1280 pixels at a PPI of 296 pixels per inch. It measures 140.4 x 70.1 x 8.4 mm (height x width x thickness) and weigh 137.00 grams. 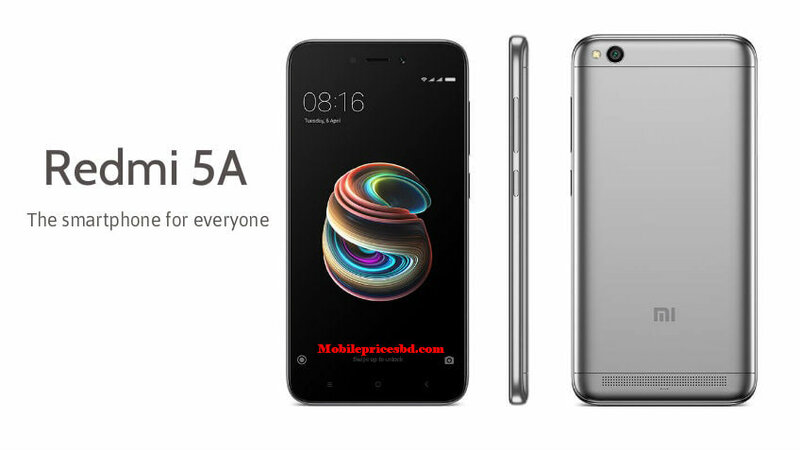 Xiomi Redmi 5 A is a Dual SIM (Nano-SIM, dual stand-by) (GSM). Connectivity options include Wi-Fi, GPS, Bluetooth, 3G, and 4G. Sensors on the phone include Sensors Accelerometer, gyro, proximity, compass, and barometer. As far as the cameras are concerned, Xiomi Redmi 5 A packs a 13-megapixel primary camera with LED flash on the rear and a 05-megapixel camera for a front shooter for selfies. Xiomi Redmi 5 A is powered by Quad-Core 1.4 GHz. Cores Quantity 4. Xiomi Redmi 5 A comes with 2/3 GB of RAM. The phone packs 16/32 GB of internal storage that can be expanded to 256 GB via a microSD card. Xiomi Redmi 5 A is powered by a 3000 mAh Li-Ion (Lithium Ion) non-removable battery. 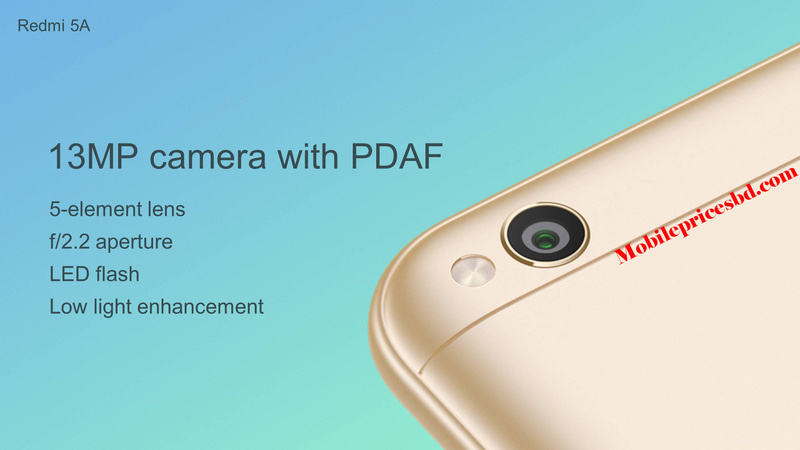 05-megapixel camera (f/2.0)autofocus, dual video call, gyro EIS, Auto HDR, 1080p, auto face detection, face beauty, HD video rec. This Xiomi Redmi 5 A is a flagship Smart Phone from Xiomi mobile company .Now Xiomi Redmi 5 A is available in Bangladesh mobile market from 23 November 2017.